A.Vitrified (or vitreous) is a term meaning ‘glassy’, which is applied to ceramic ware that has an extremely low porosity. Low porosity (water absorption ≤0.2%) is an important consideration in areas where food hygiene is essential. All Distinction and Performance items are fully vitrified. A.Alumina is aluminium oxide. Aluminium is a metal; alumina is a ceramic material. It is, therefore, perfectly safe to use Distinction or Performance (both of which contain alumina) in a microwave oven*. A.Alumina is added in order to increase the strength of the product. This, together with meticulous attention to shape design and edge finishing, ensures that all Distinction and Performance products possess excellent resistance to chipping and breakage. A.Clay is a natural mineral characterised by its plasticity. A.China clay is a white-firing clay found in the U.K. primarily in Cornwall. A.In general, ball clay is more plastic and less white-firing than china clay. In the U.K. the main deposits are found in Devon and Dorset. A.Feldspar is a mineral added to the body to reduce the temperature at which vitrification occurs. A.Silicon dioxide (silica) is a commonly occurring mineral added to ceramic products to provide a relatively inert filler that also improves their physical characteristics. A.Biscuit firing is the process of firing pottery before it is glazed. A.Glaze is the thin, glassy layer formed on the surface of a ceramic product by firing-on an applied coating. Glaze is also the name used to describe the coating itself which consists of a suspension in water of finely ground glass, together with a relatively small amount of clay. Q.Why are ceramic products glazed? A.Products are glazed to give a smooth, glossy surface that is resistant to wear and tear and detergent attack, is hygienic and easy to clean. Q.Do any of the Steelite glazes contain lead? A.None of the glazes contain lead. Q.Is it safe to use Steelite tableware in an oven? A.All products are perfectly safe to use in conventional ovens. Temperatures of up to 300°C should not pose a problem, given proper attention to handling. The important point to bear in mind is that, in common with most other ceramics, tableware items should not be subjected to sudden, very large, uneven temperature reversals (i.e. heating or cooling). Q.Is it safe to use Steelite tableware in a microwave oven? A.All products are safe to use with the exception of any that are decorated with a precious metal such as gold or platinum. Q.Is it safe to use Steelite tableware in a freezer? A.It is perfectly safe to do so and, in almost all circumstances, to use the product direct from freezer to oven. 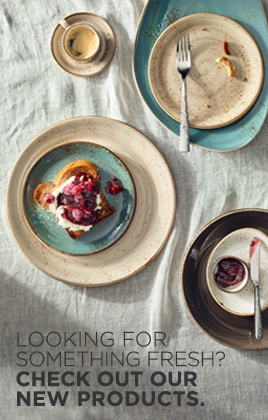 Q.How long will the pattern on my Steelite tableware last? A.As most of the patterns are applied beneath the glaze layer, their service life will equal that of the glaze surface. On-glaze decoration is applied on top of the glaze and fired at a lower temperature. Nevertheless, the durability of all such decoration meets the requirement of BS EN 12875–-5 : 2006 Mechanical Dishwashing Resistance of Utensils – Part 5: Rapid test for ceramic catering articles. Q.How many dishwasher cycles will my tableware survive? A.Provided that the ware-washing machine is operating as specified in its manual, and best-practice is followed in its loading and unloading, Steelite tableware will withstand many hundreds of washes. Q.Why are there pin marks on the back of my plates? A.All Steelite flatware items are supported during the glazing firing process on three small, triangular cross-section refractory pins. After firing, a tiny fragment of this material remains in the glaze until removed by a grinding process. The tiny areas from which the pin marks have been removed have no negative impact on a product’s performance. The major benefit of supporting flatware in this manner is that there is no need for the foot of the item to be unglazed. This removes one of the major causes of in-service glaze wear, occurring when sliding impacts take place during stacking, and helps to ensure that Steelite products give long, trouble-free performance, even in very demanding environments.